This Beetroot poriyal/Curry/Stir-fry is a tasty side dish for Rice. Beetroot is an excellent source of folate and including it as a part of our diet gives loads of health benefits. 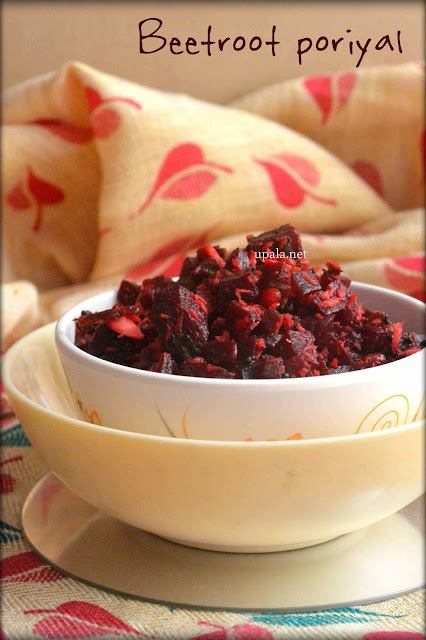 If your kids are fussy about eating these beets, try delicious BEETROOT HALWA recipe. 1) Heat oil in a kadai and add Mustard seeds, Cumin seeds to crackle. Next add Urad dal, Green chillies and fry till light brown. 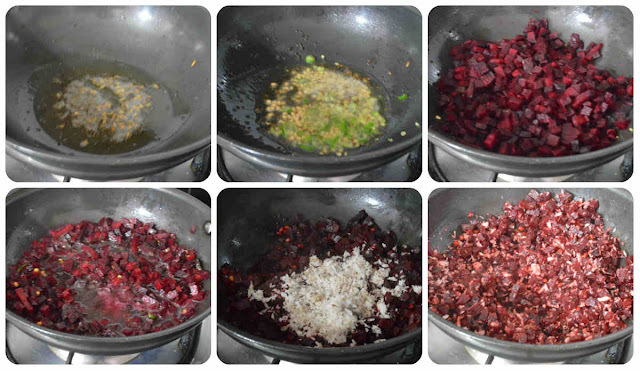 2) Now add choped Beetroot and fry in oil for a min. Add 1/2 cup water, salt and close it with a lid to cook in medium flame. 3) After beetroot is cooked, add grated coconut and mix well. After 1 min, switch off the flame. Tasty and Healthy Beetroot Curry is ready.